While many towns in Southeastern Oklahoma flourished, others simply vanished. For many of these towns, their virtual abandonment began in the late 1800s as the railroad construction flourished throughout Indian Territory. Other towns were simply swallowed up by the progress of their neighbors. 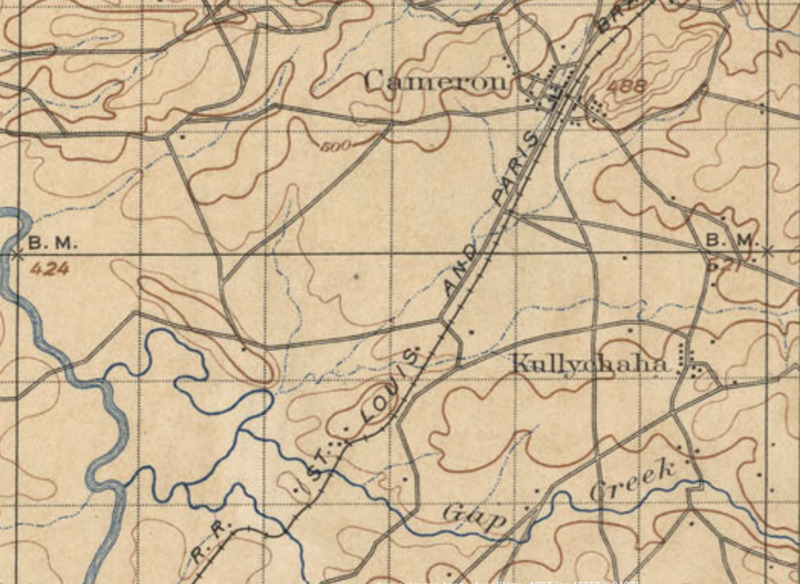 The abandonment of Kully Chaha, located three miles south of Cameron, was the result of the railroads. The town was located three miles south of Cameron. It had a post office from February 15, 1881, until November 15, 1913. The postmaster was A.H. Ritter, followed by M.C. Loggains. The name is Choctaw and means "High Spring," in reference to a spring high on Sugar Loaf Mountain. Even though the post office was established in 1881, the town had existed long before that. 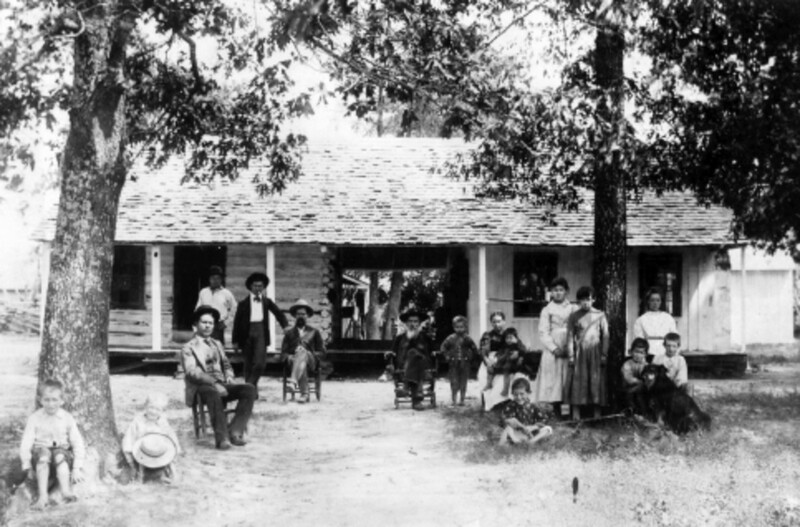 In 1879, the town is described as a "small Choctaw Indian Village in Indian Territory." In the 1890s, Kully Chaha was advertised as a "Mountain Resort," and a veritable, "Perfect paradise to the invalid and overworked." In that town, a general mercantile store, a Masonic lodge, a blacksmith shop, and a small hotel were known to have existed. This was mostly an agricultural community, with most of the population living and working on farms outside of the town center. Caston is one of those towns with quite a unique history. The name of the town began as Braidwood, then was changed to Pocahontas, and finally Caston Switch. Braidwood was first established on July 11, 1891. On May 11, 1895, the name of the town was changed to Pocahontas, and then once again changed to Caston Switch, April 18, 1898. Caston Switch, so named because of the railroad switching station there, merged with the small town of Caston on that same year. Prior to the merger, Caston and Caston Switch were technically separate towns. Caston started life as the town of Maxey. Maxey was established on June 4, 1884, and named for N. B. Maxey. He later became a prominent Muskogee attorney. Maxey became Caston on November 5, 1887. By October 1891, the town of Caston had pretty much dissolved. The post office was removed that year since the town of Caston Switch already had a thriving post office. In 1898, the decision was made to merge the towns. 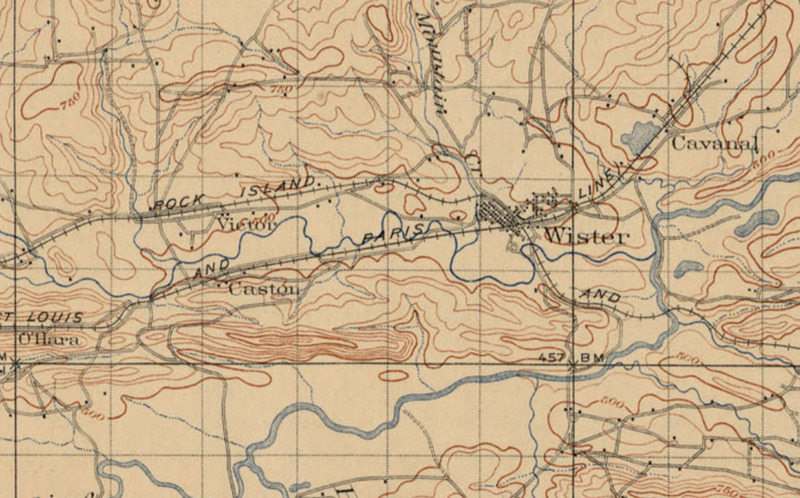 The settlement was once located three miles west of Wister. The town, whatever name it chose to go by in any given year, began as a small settlement. With the railroad, the Kansas and Texas Coal Company made a significant investment in the area, which helped propel the village into town status. As the coal mines were exhausted, the town began to die off before being virtually abandoned in the early 1900s. As the railroad came encroached on Indian Territory, many towns also sprang into existence. Following the line of the old railroad, each of these towns was positioned approximately 2.8 miles apart. There was good reason for this. When the railroad men were working on the lines, they would set up camps every 2.8 miles to ensure that supply lines were well tended. In many cases, these camps would turn in to small towns, especially as more workers arrived and more facilities to support the workers were needed. 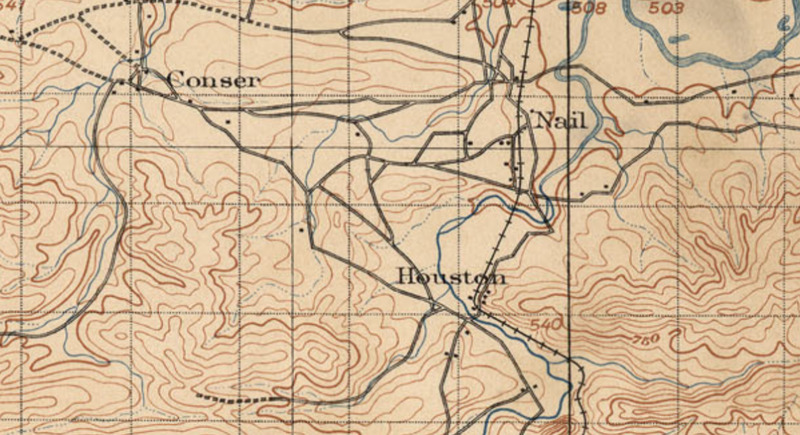 Following the route of the railroad, this is evident today on many maps. From the south, you can trace this starting with Spiro. Following Spiro, there was an un-named camp about where the modern-day AES/Shady Point plant is, then Panama, Shady Point, Tarby Prairie, then Poteau. From Poteau, along the Frisco, you come next to Sorrels, Smacker, Cavanal, Wister, Fanshawe, Red Oak, Panola, Wilburton, and on down the road. 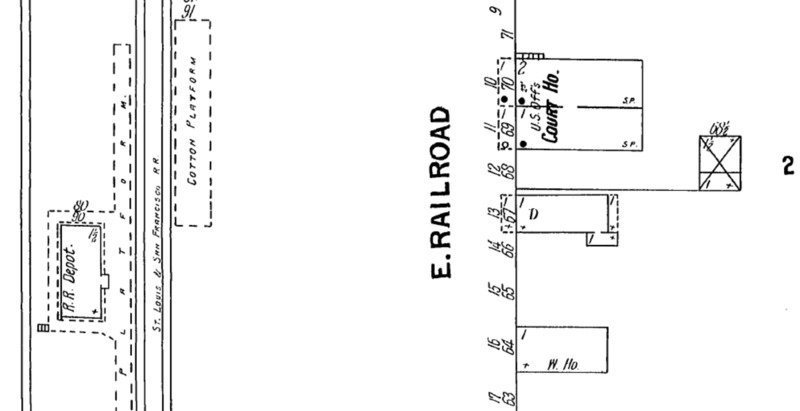 The railroad tried to connect existing towns; however, many towns throughout LeFlore County were established as a direct result of the railroad lines. While many of these towns already existed as small villages, the railroads began turning them into boom towns. Some towns vanished once the railroad work was complete while others continued to thrive. The town of Cameron was established January 21, 1888. It was named for William Cameron, a local mining superintendent. Prior to that, the land was owned by a Choctaw, Mr. Benjamin McBride. On his allotment, his family ran a large farm that grew grain and cotton, as well as raising a variety of livestock. After the railroad came through, the land became prime real estate. On March 1, 1895, the Federal Court at South McAlester was re-designated as the Central District and authorized to hold sessions at Atoka, Antlers, and Cameron. This allowed a courthouse to be created in the town. The Federal Courthouse was located on the north corner of Court Street and the railroad. To the south were several lawyers officers, including that of Mr. Varner. During this time, the town of Cameron was booming. Directly at the end of Court Street was the old Cameron Depot. The Cameron Hotel and the Commercial hotel were also nearby. Other businesses include two lodge halls, several general mercantile stores, the post office, two drug stores, two livery stables, and a blacksmith shop. There was only one large industry at the time, and that was McMurray's Cotton Gin, Grist Mill, and Lumber Yard. This boom only lasted around 10 years, from 1888 until 1897. During those years, Cameron was the chief business town in the region. The Kansas City, Pittsburg, and Gulf (KCS) brought that to a close in 1897. At that time, they brought their line in down from the Arkansas and through Poteau. This made Poteau a junction point and caused the quick decline of the Cameron. Because of the decline of Cameron due to the railroad, and the progress seen in Poteau, Congress decided to move the courthouse from Cameron to Poteau in 1900. The courthouse remained in Poteau until statehood in 1907. For many years, LeFlore County locals believed that the county seat had once been located in Cameron. This myth began largely due to the establishment of the Federal Courts there. At this time, Cameron was part of the Choctaw Nation in Skullyville County. Skullyville (the town) was both capitol and county seat of the Choctaw Nation. The U.S. county seats were not designated until statehood, in 1907. Between 1907 and the elections in 1908, many counties in Oklahoma did not have a designated county seat, however, the location of the former federal courts were used in place. Poteau was elected to be the U.S. county seat in early 1908. On February 2, 1900, the 56th congress revised the decision to house the Federal Court in Cameron. The previous decision was approved on March 1, 1895, and was designed to “. . . provide for the appointment of additional judges of the United States court in the Indian Territory, and for other purposes." It also stated, "The central district shall consist of all the Choctaw country, and the places of holding court in said district shall be at South McAlester, Atoka, Antlers, and Cameron." Poteau is located at the junction of the St. Louis and San Francisco Railway and the Kansas City, Pittsburg, and Gulf railway. People required to attend court can reach this town from four different lines of road. Poteau had a population of around 2,000 people. It was considered one of the fastest growing communities in the area. Poteau has a brick block, which will be provided with an ample courtroom and all necessary office rooms, vaults, etc., for the use of the court officers. This “brick block” refers to the city block on the corner of Dewey where the McKenna building is located. Poteau is closer to the center of the central division, and it is closer to the center of population as well. The process of moving the federal court to Poteau was not easy. All of the court records and furniture had to be moved to Poteau. Tom T. Varner, son of Robert A. Varner, was a highly esteemed lawyer living in Cameron. When he heard that the federal court was moving to Poteau, he decided to move with it. In addition to moving his practice, he also offered to move the entire Federal Court as well. After loading all of the court's documents in his wagon, it took him much of the day to travel eight miles to Poteau on rough and rugged road. 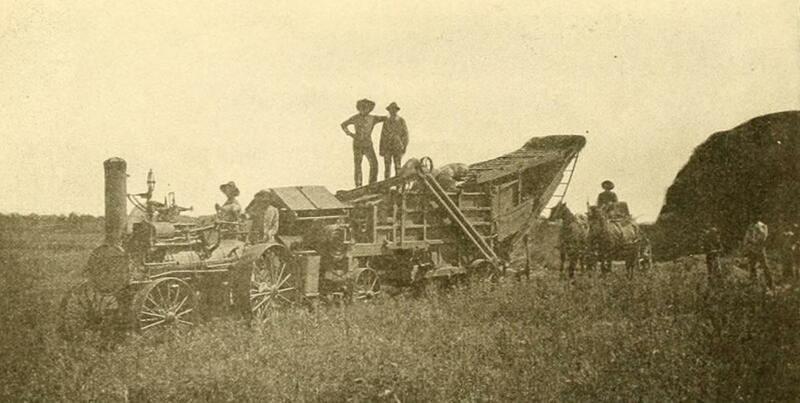 Several times along the route, Varner and his team had to stop the wagon in order to build temporary bridges. Once in Poteau, Varner and his team quickly set about establishing the courthouse on the second floor of the McKenna building. Elections for a permanent county seat for LeFlore County were held in 1908. Originally, Spiro, Howe, Wister, Panama, and Poteau were the candidates, but finally, it came down to just Poteau and Spiro. Accusations of using money and liquor to influence voters were made between the two towns. Poteau won in the end, but with a margin of only 400 votes. While Cameron was never the County Seat of LeFlore County, it has played an important role in the development of the area. He was one of the most controversial and colorful figures in American History. He was a lawyer, congressman, and senator before becoming Commander-in-Chief of the Texas Army. He was a signer on the Texas Declaration of Independence; his men defeated Mexican General Antonio López de Santa Anna at San Jacinto to secure Texan independence, and was voted president twice after Texas won its independence. It’s no wonder that many towns in the country were named after him. Houston was just one such town. Established on August 14, 1896, the town was named for the larger-than-life hero, Sam Houston. 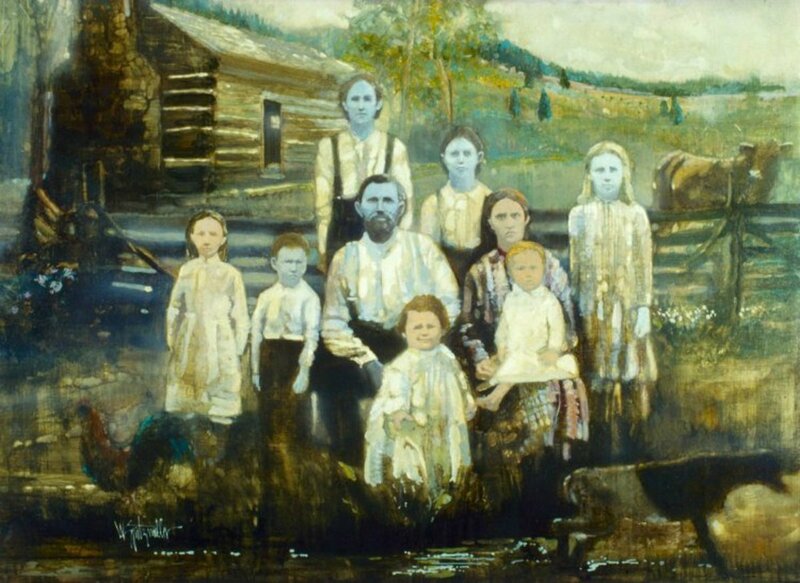 The present Nail family of the Choctaws are the descendents of Henry Nail, a white man, who came among the Choctaws about the time Nathaniel Folsom, John Pitchlynn and Louis Le Fiore came; and as they did, so did he, marry among them, was adopted and thus became identified among that people. He rose to the position of chief and exerted, as did the three other above mentioned, a moral influence among that noble and appreciative people, with whom he had cast his lot. This area where his family settled became known as Nail’s Valley. By the time that Houston was established, much of the area had been cleared out and developed for farm use. The original townsite was located on land that had been cleared by the Nail family. The earliest record of the town being in existence dates back to 1889. At this time, there was a hotel, a general store, and three more unidentified buildings. The town grew quickly. Because of the settlement at Nails Valley, early roads already crisscrossed throughout the area. The town resembled those from a wild-west movie set. All of the buildings were wood frame structures. The fire department consisted of a night watchman, and the fire alarm was two gunshots fired in quick succession. Two such shots rang out in early 1895. Fire broke out, and like a pile of dry matchsticks, the town was quickly engulfed in an inferno. The fire destroyed much of the town, including the entire main business district. However, the residents were resilient and instead of giving up, they rebuilt a half mile to the south. A new town began to emerge. By 1896, traces of the fire that destroyed the town were gone. 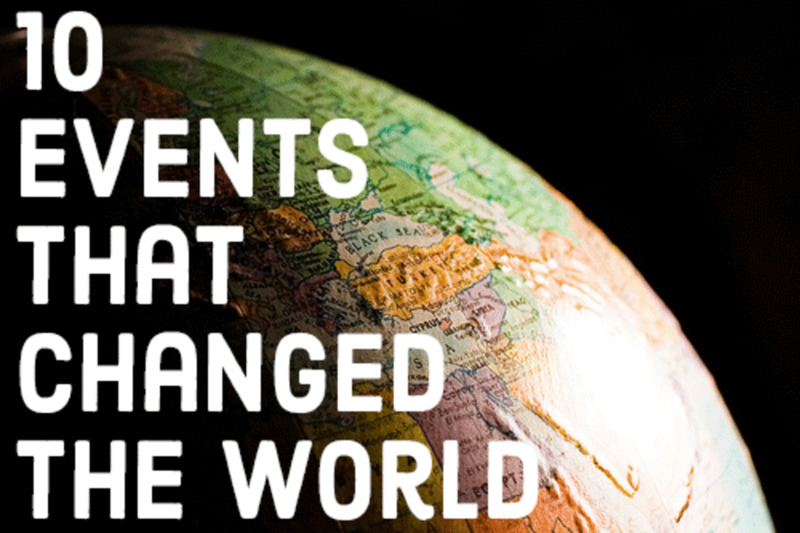 A new post office was established, and prosperity came to town. This prosperity didn’t last long. When the Kansas City Southern railroad came through in 1898, it bypassed the town of Houston. The closest point was scheduled to be laid about two miles to the north and west of town. Having faced adversity before, residents simply decided to move the town. Again. With this new location, the town became the crossroads between the towns of Cosner, Heavener, and Thomasville. This new town was developed with the help of J.W. Hodgens. Hodgens was a timber buyer for the KCS Railroad and helped supply much of the timber for the new town. In appreciation, residents renamed the town to Hodgens. However, when the Post Office was established on April 25, 1910, they mistakenly named the town Hodgen. Although the official name is Hodgen, many people still refer to the town by its correct name, “Hodgens." There is a fenceline between Red Oak and Fanshawe with a brick and concrete foundation on the East side of Hwy 270. Do you know what town this would have been? I recall the fence line, but don't remember exactly where it is. There were once two towns between Red Oak and Fanshawe right off of Highway 270. Coming from Fanshawe, the first town you would have encountered would have been Barton. Today, it would have been located near Williams Drive. This was just a small community consisting of a few homes and a general store. There were plans to have a depot, but I don't believe one was ever constructed. Past Barton, you would have come to Hughes. Hughes was a mid-sized town of the time, and headquarters of the Le Bosquet Coal and Mining Company as well as the Turkey Creek Mining Company. It would have been just before you get to Turkey Creek Road. While there wasn't a town named Turkey Creek, just south of Hughes was the town of Le Bosquet. It would have been located near the ridge on County Road 152. Hughes was a fairly good-sized town that included a depot as well as several stores and other businesses. The only other town would have been the town of Bull Hill, which was located quite a ways off of Highway 270 on Bull Hill Road. Barbara, I have quite a few. If I get a chance, I'll upload one of them here. I believe you can send me an email through here as well - if you don't mind, do that and I'll email you some more information on Tarby Prairie. I have lived in Panama, Ok all my life and remember a lot of this information from my Grandparents. I have been looking and looking for an old map that actually showed Tarby on it. My Grandmother spoke of going through Tarby on the way to Poteau often. Have you come across one? Joyce, Hughes was established May 17, 1900. It lost it's official designation on July 15, 1931. It was named after Joe Hughes, a local coal operator. Around the 1920's, a lot of the coal industry in the area dried up for awhile. Most of the workers from that time worked for the Turkey Creek Coal Company. Their lease had a vein that was only around 4 feet thick. They could pull out 10,000 tons of coal a day, all hauled out by mule team before being loaded on the railroad. 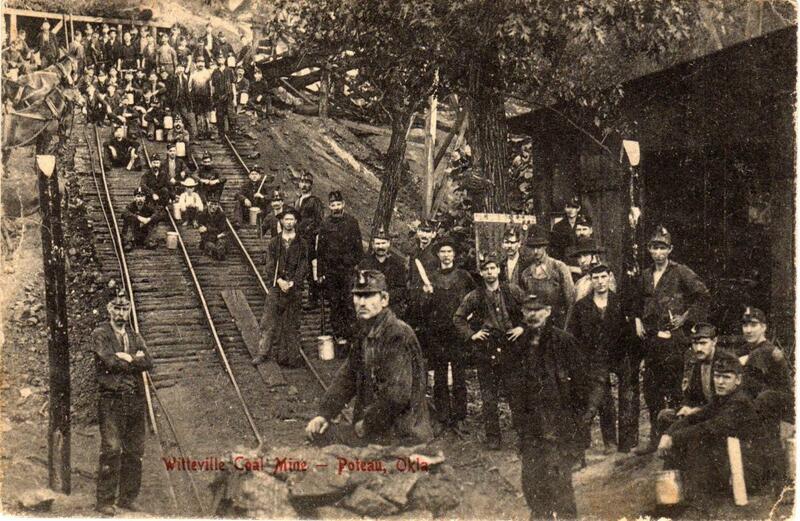 The mines there were similar to Witteville and employed around 50 men. The last mention of the mine that I could really find was around 1916. A company briefly tried to revive it in 1934, but it was very short lived. With the mine being the main source of income, and the vein being small, once it was played out then there wasn't a lot left to hold the town together. The houses you mention were section houses. I don't know about the ones in Hughes, but most of them that I've seen were tiny - maybe 10' x 10', one room and maybe, if they were lucky, an iron stove. In some company towns, there could be several people living in one section house! Say, Joyce, just spoke to Aunt Bonnie. Church was held in the Hughes school house by itinerant preachers, including Rev. Davidson. What happened to Hughes Oklahoma.....SE Oklahoma near border of Texas......My mother was born there in the coal mining community. Coal mine owners had housing for the workers.....they were, as my mother told me, very small houses, all alike, all in a row. Hughes has been gone a long while now....they moved to Red Oak....4 of my uncles died in the coal mines as did my grandpa, James Albert DeLapp. Another uncle died in WWI and is buried in Normandy, France. The other was wounded in WWI and was disabled the rest of his life. He was the only uncle I knew on that side of the family. He lived with my grandma til he passed, both, in Red Oak, Oklahoma. Many of the old towns are gone, but geographic features bearing their names are not. I remember Caston Creek and Nail Creek. Is the Caston railroad bridge still by John Rogers's house at the western edge of Wister--house occupied by his daughter Essie till 2001?